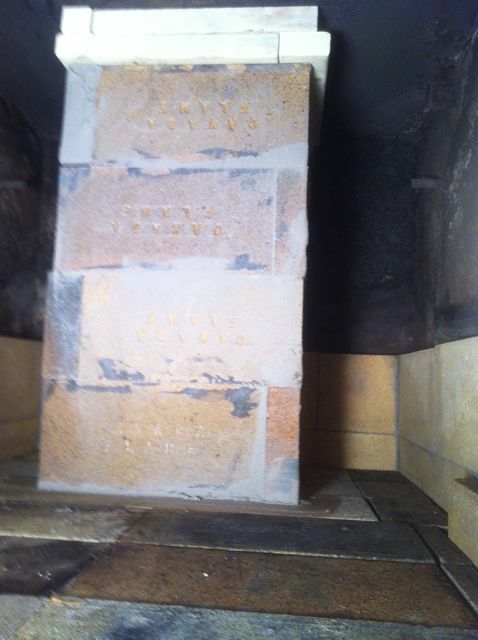 An older and large woodstove was reworked to improve it's efficiency of combustion, efficiency of heat transfer and safety. 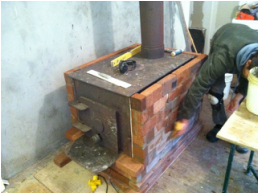 The large firebox was completely redesigned and this has resulted in incredible efficiency gains - the stove's owner reports using only 1/8th of the firewood as before!! What was previously a 36" deep firebox is now a 16" deep firebox, separated by a partition wall from a rear "bell". 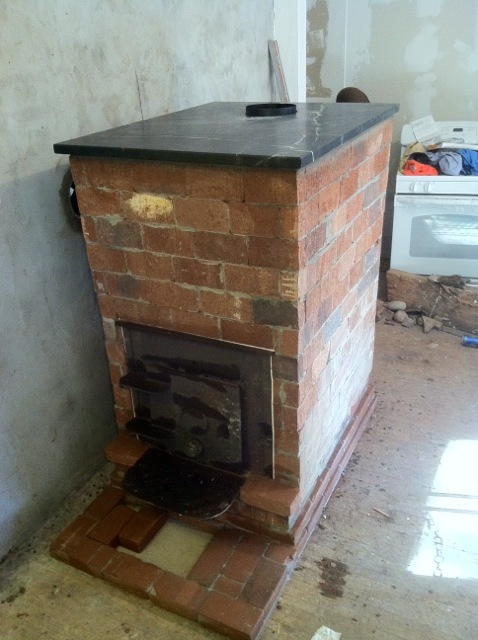 A masonry shell was constructed around the stove to warm room air and provide longterm radiant heat. 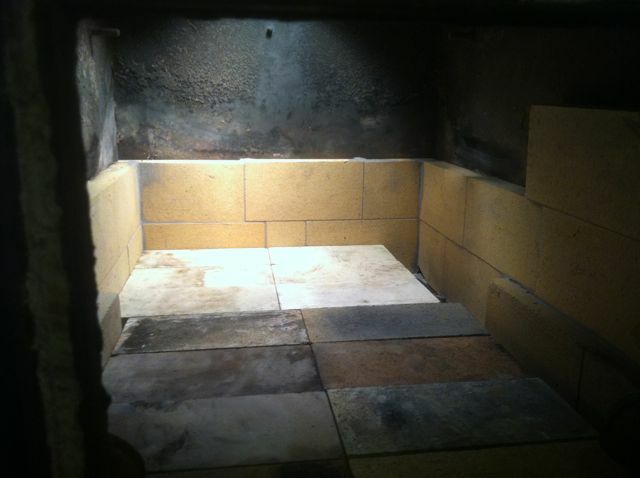 Looking into the 3ft deep firebox, with newly mortared lining and dry laid floor. Up channel built in the back "bell" to vent to the exit pipe. Not visible is the entrance to this up channel at the bottom on the left side. 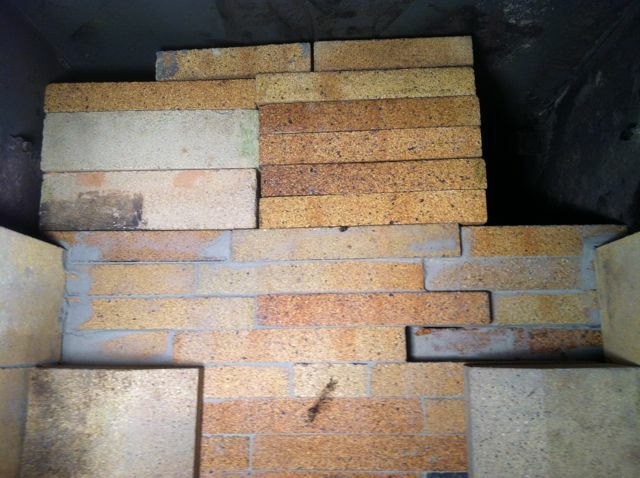 Partition wall dividing the inside of the woodstove. The bottom half is mortared to resist fuel loading, while the top is laid dry to allow tuning. Upper right opening is the primary exit for gases, resulting in a long corkscrew path to the up channel. The smaller left opening helps even out heating on the top of the stove. There are two brick plugs at the bottom corners to permit cleaning of the back bell. Working on the shell. Room air will pass thru the gap between the stove and the shell for improved heating. Capped with soapstone and ready for reinforcing plaster. Not visible, but below the cantilevered steel shelf is the front warm air intake. Interestingly, the leftside wall is ferrocement.